Eric Joseph McAuliffe, one of Ireland’s most renowned genealogists, was born on the 27th. December 1919 at Thornberry House near Kilrush, Co. Clare, only son of Dr. Michael Joseph McAuliffe and Mai Gertrude Corry. His father, a medical practitioner who, during his youth, had travelled widely and studied other cultures, was a keen collector of local history during Eric’s formative years – and it was his father’s wish that Eric should one day write a history of the parish of Kilmurry McMahon. His father’s wish was indeed fulfilled many years later by the publication of Eric’s Notes on the Parishes of Kilmurry McMahon and Killofin, Co. Clare, and Tombstone Inscriptions from Kilrush. His father’s collection of anecdotes instilled in Eric a love of history that remained with him throughout his life. After his schooldays at Mungret College, Co. Limerick, Eric considered a vocation for the priesthood but eventually settled on a career in medicine. However, his studies came to an abrupt finish when his father’s illness and death induced him to return to Thornberry to tend to family affairs. He retained an interest in matters medical and those who knew him could attest to his knowledge on the subject and his ability to cite latin terminology. Shortly afterward, the McAuliffe family moved to Dublin (birthplace of his mother who was one of the Corrys of north County Dublin) and there Eric resumed his interest in local history and biography. He started a career as a freelance genealogist, one of the few independent researchers unattached to a government office, and his published works and frequent contributions to The Irish Genealogist earned for Eric the respect and friendship of the Doyen of Irish Genealogy, former Chief Herald, Dr. Edward MacLysaght (1887-1986). Eric carried out extensive genealogical research on behalf of Irish families throughout the world over the period from the pre-internet 1960’s through to the late 1990’s, and researched the genealogy of many prominent families including the Fitzgerald Kennedys and the Nixons. He received a commission from the Australian Ambassador to Ireland, Mr. Lloyd Thompson, and from the famous Texas oil tycoon, Mr. Pat Fletcher, and from many other notables. His series of transcribed monumental inscriptions from Dublin graveyards, undertaken with the assistance of Mr. Julian Walton, FIGRS, and Mr. Roderick J. O’Kelly-Lynch, the genealogist (cousin to Eric), were published in The Irish Genealogist. Also recorded and published, the names and dates on the coffin-plates in the vaults of St. Andrew’s Church, Westland Row, Dublin. His comprehensive index to extant records of Dublin Church of Ireland parishes was adopted and used in several published genealogical research aids. It is also worth noting that Eric assisted Mr. Charles Lysaght with research for his biography of Brendan Bracken (founder of The Economist). 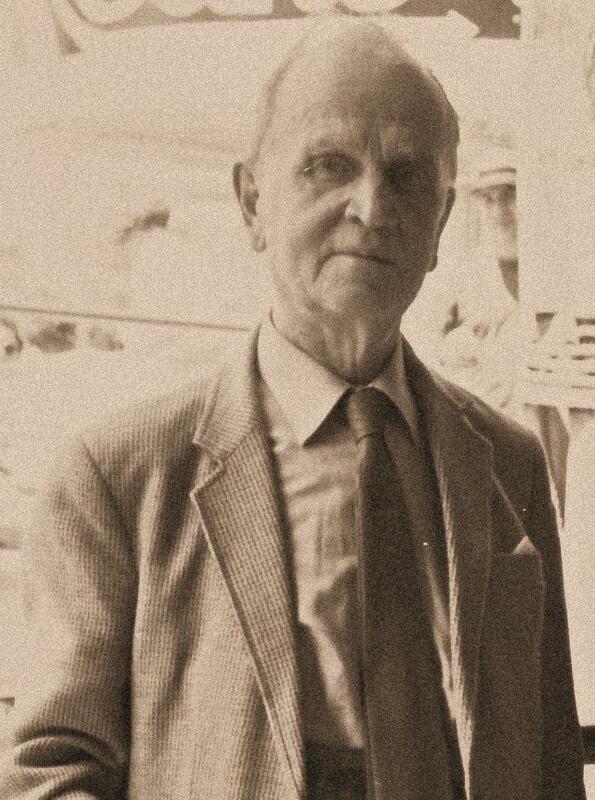 As a longstanding and devoted member of the Irish Genealogical Research Society, Eric McAuliffe was elected Fellow of the society in 1972 – and again in 1980 – the society’s first and only double Fellow! In 1984, Eric published An Irish Genealogical Source: The Roll of the Quaker School at Ballitore, County Kildare, and counted among his friends many prominent members of the Society of Friends, having attended their meetings on many occasions. About this time also, Eric took on the role of mentor to this writer and I recall on many an occasion, as I read out letters of enquiry regarding commissions for genealogical research and cited the names or the places in question, not only would he direct me to the relevant sources but would also quote from memory essential facts from the family history. In 1992, I accompanied Eric to New York where we both acted as expert witnesses in an intestacy case. Eric loved to swim, and each and every day of the year, come hail, rain or high wind, he was out there, immersing himself in the choppy waters off Monskstown’s Martello Tower. In the closing years of both his life and the life of the old century, Eric, a man of rare insight and circumspection, expressed disquiet about the uncertain role of Irish culture in the multi-cultural Ireland of the coming century, but took comfort from the conviction that the de-culturalising effect will be counter-balanced by the strength of the Irish Diaspora’s awareness of their shared identity and their common legacy. That innate sense of awareness, he felt, would be nourished by genealogical research. In his declining years, Eric McAuliffe suffered from prostate cancer, to which he finally succumbed on the eleventh day of the eleventh month of nineteen ninety nine – a day of remembrance for all those who were privileged to know well this mild-mannered, unassuming, gentle man. Eric Joseph McAuliffe – Ave, atque vale!